A classic recipe made paleo- and Instant Pot- friendly. 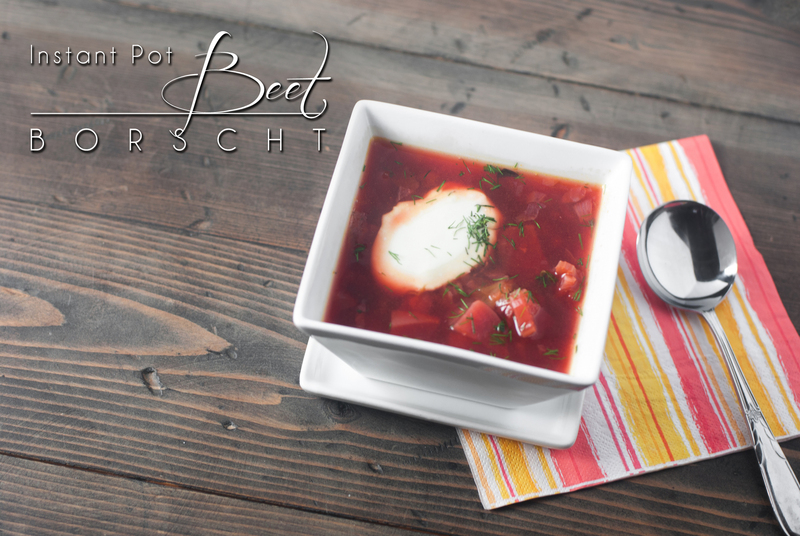 Instant Pot Beet Borscht is packed with vegetables and warm borscht goodness. It is decidedly Autumn. Daylight savings time really clinches it for me. Winter is coming. And the time change makes me cranky. It is dark when I get home from work, it's dark when I go to work. And it makes me want to go home and go to bed. So obviously using my Instant Pot so that I can have dinner at 5:45 and be tucked warmly in bed by 7pm is a win for me. Now don't get me wrong, I like fall, and even winter, but the time change messes me up. I called my ma and was whining about feeling crappy, and Mom informed me I have always had a hard time with the time change. Even though I am single with no kids, and got nearly 11 hours sleep the first night of the change I still feel out of sorts. I know most of you no longer feel bad for me in any way shape or form. I did a little research, I was curious as to why we subjected our population to the torture of twice annual time changes. It is all about energy consumption, making the most of the natural light in order to preserve candles, coal, fuel or electricity (or whatever is the fashionable energy source). Daylight savings started in the early 20th century, becoming more important during war time. Why do we still swing the clocks the first Sunday in November and the last Sunday in March? Some places do not, but here in Canada, on the 50th parallel (around where I live) it does make some difference for early risers. It seems a little archaic, but we can't seem to agree if it should stay or go. I'm going to try getting up early and assembling glorious Instant Pot Beet Borscht before I go to work so that dinner is ready when I come home. An early dinner means an even earlier bedtime!! Hurray! Place washed beets in a steamer in the instant pot with 1 cup of water. Steam for 7 minutes, quick release, and drop into an ice bath, the skins will slip right off! Dice. Add: beets, carrots, celery, garlic, onions, cabbage, bay leaf, stock, salt and thyme to the Instant Pot. Press the “Soup” setting adjusting the time to 45 minutes. Allow a natural pressure release or else it's soup splattering everywhere). Spoon into bowls adding a dollop of sour cream and garnishing with fresh dill. Awesome! I never thought of cooking my beets in the instapot! And only 7 mins, brilliant! What do you mean by natural pressure release? Jut twist the valve and wait? Just making sure so I don’t end up with a red ceiling. Hi Aimee! By natural pressure release I mean just leave it sealed up for 10 minutes or so, so that you DON’T end up with beet soup all over everything. Quick release is the twist the knob and let it go, natural pressure release means you let the temp come down a bit and it releases on it’s own. After 10 minutes or so you should be able to twist that knob and let the rest of the pressure escape! Beets in the Instant Pot are great! No peeling needed! HI! 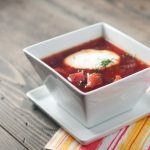 It’s really so people don’t get molten hot borscht shooting out the spout of the Instant Pot, but it can take a long time for a NPR especially when you are hungry! There was no color left in your beets? Really? That is crazy… where did it go? Did it transfer into the water? Good catch Lidia, I should have just put “all ingredients”! I made this and added some ground beef to it. It was actually frozen when I added the beef so I was a bit worried it wouldn’t cook through. It turned out amazing. Totally delicious and hearty for winter. Good call on the ground beef!! Thanks, Natalie! Does this recipe really need 6 cups of stock? Can you use less? Absolutely you can use less! You’ll have more hearty chunks in your borscht! What about making this without an instant pot? Maybe in the Slow cooker? Made this today and it was just lovely! 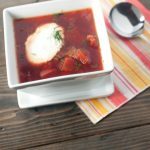 Haven’t had borscht since I was a kid! What we did though is then puree after cooking to make a nice thick fibre rich and hearty blend. Fab! Thank you! I also made the soup and it was not red. My opinion is your cooking time is too long. I am new with my instant pot but have been making soups and 45 minutes seems excessive. Yes it tasted okay but the colour was not there for borscht. Interesting! It is possible, I tested this recipe multiple times and still had colour. Really the cook time could be cut back since the broth is already made and it is just vegetables in there. I’ll make agaian, and try to cut back the time. No color in mine either (but orange). 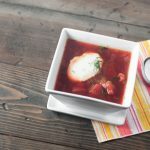 Having made borscht before, a splash of white vinegar doesn’t alter the taste much but helps retain the redness of the beets. Unfortunately I didn’t try it with your recipe. I agree that the cooking time seems too long but my veggies were not mushy so it worked out OK. I doubt this is the reason for the lack of redness though – I think it is because they were steamed first and then cooked in a lot of liquid. Hi! Do you use red or green cabbage in this recipe? Thanks! Up to you! I used red but either would work! That is fair, as long as it was good! !